Captured on the pages of this, a new version of a highly original book are 330 etchings, engravings, woodblocks, linocuts, silkscreen, collagraphs and lithography from 56 UK printmakers. All feature cats as the dominant or significant subject. Many are witty or whimsical; some bold, others subtle. Most depict aspects of feline behaviour that will be familiar to those who share their homes with cats. The artists themselves include in these pages their experiences and anecdotes. 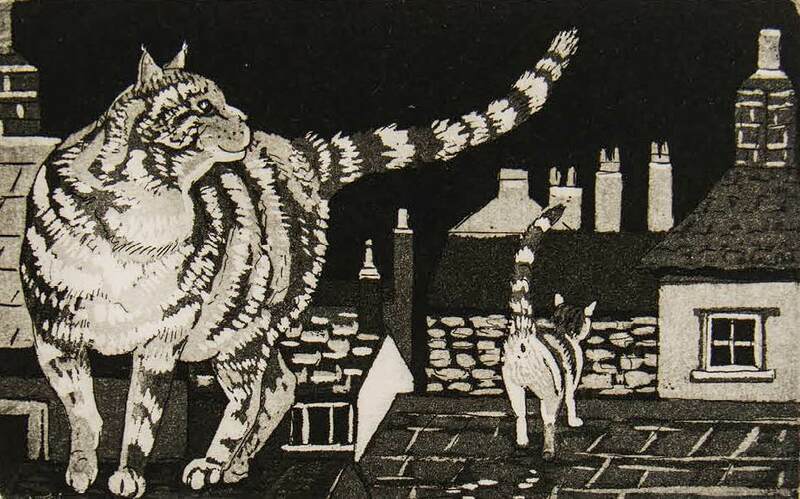 They also attempt to explain what it is that makes the domestic cat such a popular subject in printmaking. Leonardo da Vinci probably got it right nearly five centuries ago when he said that “the smallest feline is a masterpiece”. Several of the artists whose work is included in the book are regular exhibitors at cambridge contemporary art, amongst others Mychael Barratt, Angela Harding, Celia Hart, Kay McDonagh, Linda Richardson and Glynn Thomas.